Golf cart skins and decals can give your golf cart the custom look that you want. With lots more options and designs than a paint job, your golf cart body can look like new with these wraps. Perhaps you have some chips or scratches, but don't want to pay for a new paint job. Decals and wraps are a much cheaper option than painting your cart. Choose from a camouflage look to metal effects or snake skin. The graphics are applied directly to the surface of your golf cart using a peel & stick application. A kit will consist of several large sheets of graphic film or pre-cut sections specific to your golf cart make and model. √ Lots more options than just picking a solid paint color . Some very cool air brush designs are now available. √ Much less expensive than a new paint job. A full kit runs between $185 to $350. With the help of a friend, you wrap the complete body of the golf car using a heat gun or hair dryer. The hair dryer is recommended for any first time user. A high gloss cast laminate covers the custom image so you will have protection for many years. 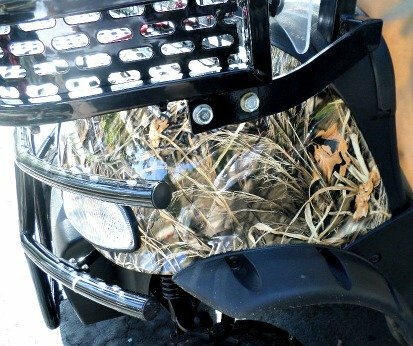 The easiest way to transform your golf cart is to get pre-cut golf cart skins at e-Bay or Amazon. No cutting big sheets of vinyl. You can see the different colors and designs that are available at eBay - most of them under $200 with free shipping. Amazon offers some different styles but the cost is higher - close to $350. Like this Decal Kit called Tribal Flames-Orange-Black. It is designed for Club Car Golf Cart DS (1983-2014). All graphics from AMRRading are digitally printed with UV resistant inks that are guaranteed not to fade for up to 5 years. The design colors are very vivid and detailed. The best in the industry. A 3M adhesive provides a durable and long lasting coverage and a thick layer of clear vinyl over laminate provides great protection from scratches. They provide kits for Club, Yamaha and EZ Go golf carts. 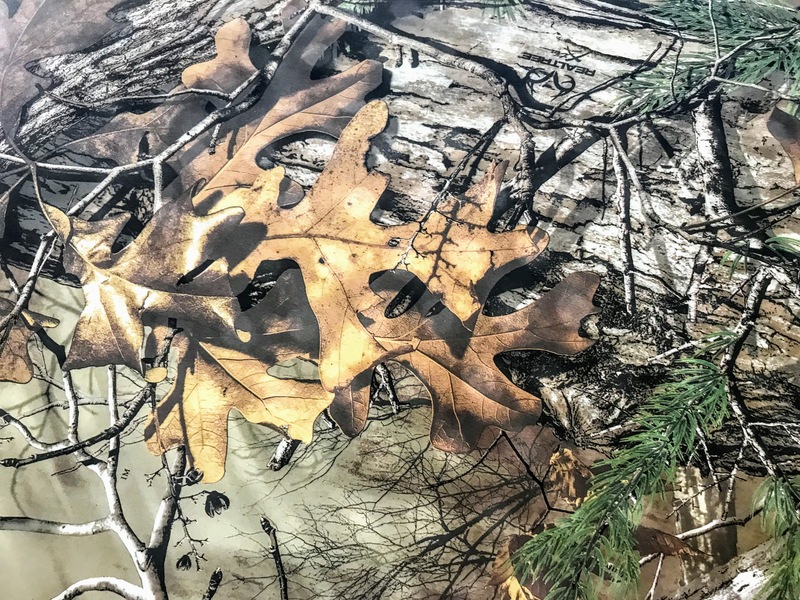 Mossy Oak Graphics available through Amazon carries a variety of camouflage body wrap kits. These golf cart skins are universal and are guarnateed not to fade, shrink, peel or crack for up to 5 years. Choose from a selection of 13 different patterns. 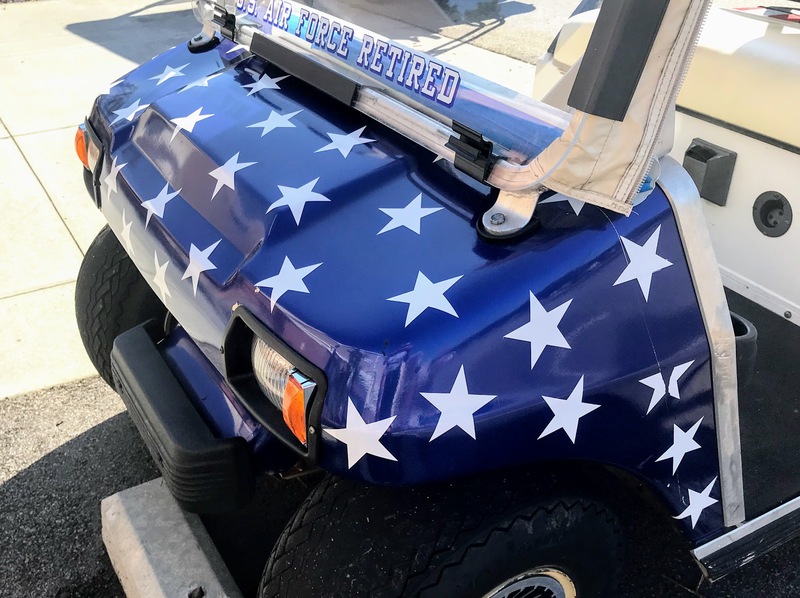 Stars and stripes golf cart skins made by Armracing Graphics are made with UV resistant inks to guarantee not to fade for up to 5 years. Once your wrap is applied the 3M brand adhesive means it will not come off. A thick layer of scratch proof crystal clear vinyl adds an extra layer of protection. If you're looking for an easy way to customize your cart consider putting on some golf cart decals - there are lots of cool options from your favorite Nascar driver (mine is Jimmy Johnson) to your favorite NFL or college football team. Some golf cart decals are made just for your cart make - i.e. only for Club Cars or Yamaha golf carts and others are universal and will fit on any golf cart.